*APY=Annual Percentage Yield. Annual Percentage Yield accurate as of 4/1/2019. Requirements: 12 Month CD with an APY of 2.60% and an interest rate of 2.53%. Must be new money to the bank. To be eligible for this accounts you must open and maintain a BCB Easy Checking, Choice Checking or Senior Checking account with a direct deposit of $1,000 or more per statement cycle (payroll, state government agency or retirement benefits) and a debit card. The Checking Account must be opened at the time you purchase the CD. If the direct deposit and debit card requirements are not met within 60 days, the rate will revert to a 12 Month non-promotional CD at the prevailing rate. 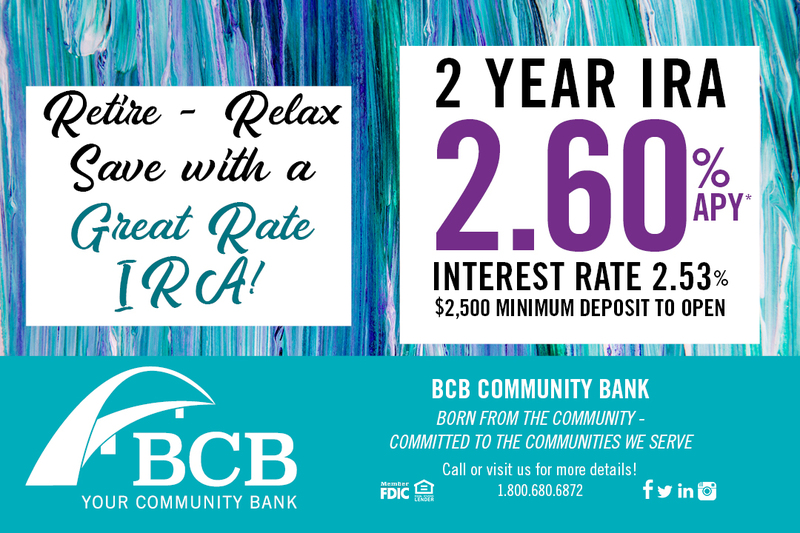 See a BCB representative for current rates. Must maintain daily balance of $500 in the account each day to obtain disclosed APY. Interest will be compounded daily and credited monthly. APY assumes interest will remain on deposit until maturity. Early withdrawal penalty will be charged for funds withdrawn before maturity date. Penalty will equal one year of interest on account. Account will automatically renew as an 12 Month CD at the prevailing rate. Grace period of 7 calendar days after the maturity date to withdraw funds without being charged a penalty. This rate is only offered on the 12 Month CD, as advertised. Offer maybe withdrawn at any time. Activity or maintenance fees may reduce earnings. **Customers meeting the aforementioned requirements will also qualify for a complimentary 3x5 Safe Deposit Box for one year where available and while supplies last. *APY=Annual Percentage Yield. APY accurate as of 11/01/2018. Traditional 2 Year IRA statement account. Must be new money to the bank. Must maintain a minimum daily balance of $2,500 in account to obtain disclosed APY. Additional deposits of $100.00 or more are permitted. Individual Retirement Accounts (IRA’s) are subject to limitations and/or penalties imposed by the Internal Revenue Service. Penalties for early withdrawal may equal 6 months of interest and are based on IRA requirements. Interest will be compounded daily and credited monthly. APY assumes interest will remain on deposit until maturity. Account will automatically renew at maturity to a 2 year traditional IRA at the prevailing rate. This rate is only offered on 2 year IRA with an opening amount of $2,500 as advertised. Offer maybe withdrawn at any time. Activity or maintenance fees may reduce earnings. 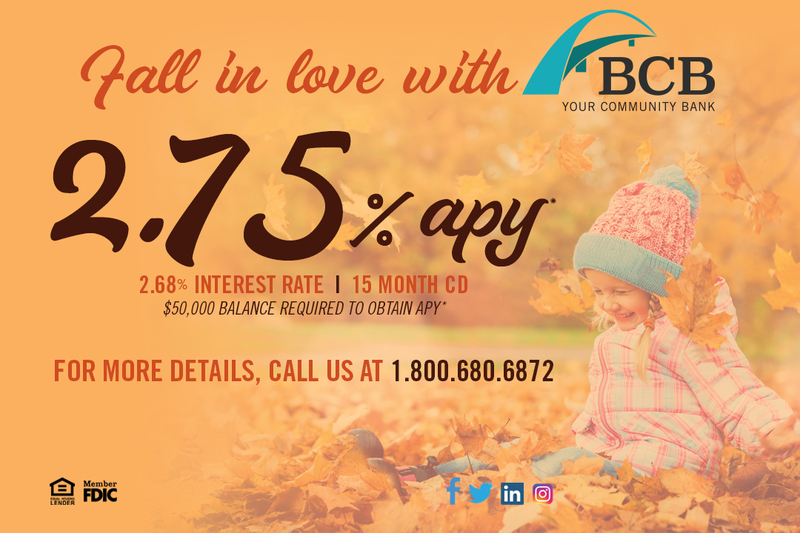 *APY = Annual Percentage Yield Requirements: 15 Month CD with an APY of 2.75% and an interest rate of 2.68%. Annual percentage yield is accurate as of 8/01/2018. Must deposit $50,000 to open. Must maintain daily balance of $50,000 in account each day to obtain disclosed APY. Interest will be compounded daily and credited monthly. APY assumes interest will remain on deposit until maturity. Early withdrawal penalty will be charged for funds withdrawn before maturity date. Penalty will equal one year of interest on account. Account will automatically renew at maturity to a 15 month CD at prevailing rate (Summer Savings CD 2018 Rollover Account) . Grace period of 7 calendar days after the maturity date to withdraw funds without being charged a penalty. This rate is only offered only on 15 Month CD with an opening amount of $50,000, as advertised. Offer may be withdrawn at any time. Withdrawal of interest may reduce earnings. Activity or maintenance fees may reduce earnings.